Our Grillz are Plated With A High Polish Finish and are One Size fits all - fits to any mouth size. All Grillz sets include reusable silicone molding bars for custom fitting and easy instructions for you to fit your grillz within minutes inside your home. Each set contains 2 lowers. 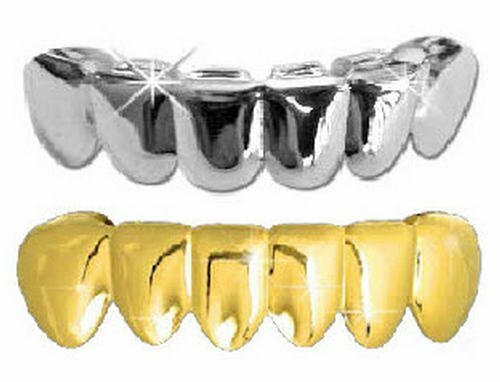 Gold-Tone Hip Hop Removeable Mouth Grillz Set (Top & Bottom) "Ballers Ice"